Contestants (Male or Female) will be given the opportunity to showcase their creative abilities by representing Black Excellence in their culture, heritage, and ancestry. Each contestant will be judged based on originality and cultural knowledge. Contestants are free to express their talents using any avenue they choose, and will also be asked to answer a question pertaining to the competition. 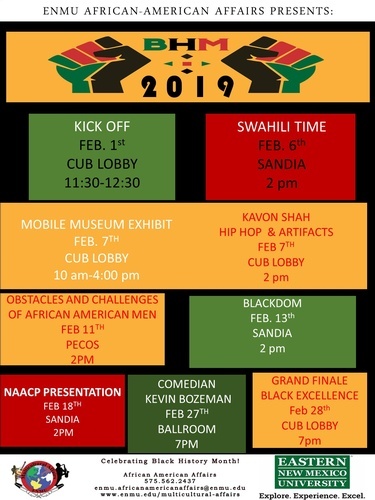 The winner will be crowned and sashed as “ENMU Black Excellence 2019-2020”, and will receive a scholarship. Kyree Mackey, “ENMU Black Excellence 2018-2019” will be hosting and crowning the new winner. Application deadline to apply is February 8th! Applications can be picked at the office of African American Affairs.